The ESFP personality type is nicknamed the "Entertainer" and belongs to the SP Creator temperament. ESFPs are fun-loving and outgoing. They seek an audience to listen to their stories and adventures. They love being the center of attention. They are people-oriented and dislike being alone. Their harmonious and lively nature makes ESFPs popular and very likeable. They enjoy action, new experiences and a life filled with excitement. ESFPs direct their energy outward. They are gregarious, talkative and sociable. They often have many friends and are energized by interaction. They are approachable and friendly. As Sensors, Entertainers process information through their five senses. They are down-to-earth, practical and live in the moment. ESFPs are Feelers and make decisions with their heart. They can be easily hurt and strongly dislike conflict. They care about other people's feelings. Entertainers possess a flexible and relaxed nature. They like spontaneous and carefree activities. They like their options open. ESFPs love to have fun and do things with the people they love. They are very outgoing and warm. They volunteer personal information with unique enthusiasm and expressiveness. If things get too serious in conversation, they lighten the mood with a joke or a happy story. They enjoy being the center of attention and do not like to share the spotlight. Entertainers are concrete learners. They are curious and interested in subjects that engage their senses such as art, music, nature, culinary arts, etc. They usually enjoy learning through hands-on experience. ESFPs can often be described with these words. They commonly posess the following strengths and weaknesses. ESFPs make up 11% of all 16 personality types. 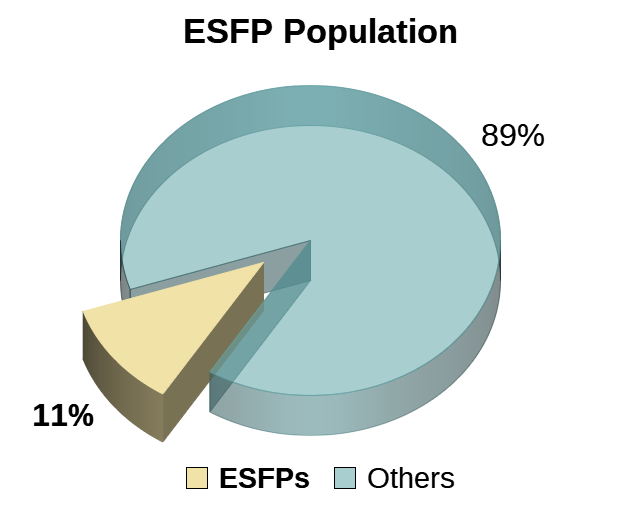 ESFPs are the fourth most prevalent personality type. On average, people are more Extraverted, Sensing and Thinking than the opposite preferences. 1 in every 12 males is an ESFP (8% of all males). 1 in every 7 females is an ESFP (14% of all females). 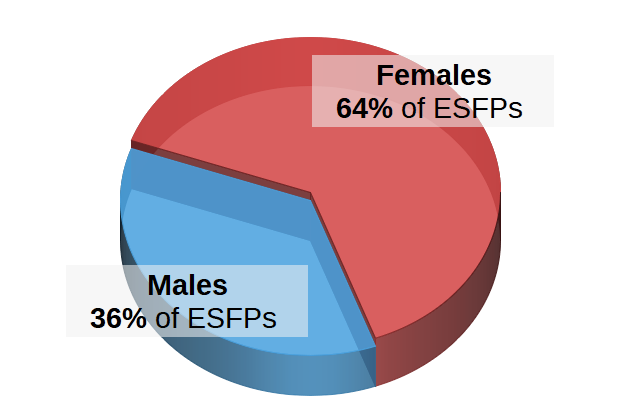 Female ESFPs are the third most common type-gender combination. There are significantly more female ESFPs than there are male ESFPs. Just over one-third of ESFPs are male. One reason there are more female ESFPs is that females tend to be Feelers (F) while males are more often Thinkers (T). The ESFP's Preferences are Extraversion, Sensing, Feeling and Perceiving. These determine the ESFP's Personality Type. Extraversion is characterized by a preference to focus on the world outside the self. ESFPs are energized by social gatherings, parties and group activities. Extraverts are usually enthusiastic, gregarious and animated. Their communication style is verbal and assertive. As Extraverts, ESFPs often need to talk. They enjoy the limelight. As Feeling people, ESFPs are subjective. They make decisions based on their principles and values. They are ruled by their heart instead of their head. ESFPs judge situations and others based on their feelings and extenuating circumstances. They seek to please others and want to be appreciated. They value harmony and empathy. Sensing focuses on the present. As sensors, ESFPs are "here and now" people. They are factual and process information through the five senses. They see things as they are because they are concrete and literal thinkers. They trust what is certain. ESFP value realism and common sense. They like ideas with practical applications. Perceiving refers to a person's adaptability and flexibility. Entertainers are random thinkers who prefer to keep their options open. They thrive with the unexpected and are open to change. They are spontaneous and often juggle several projects at once. They enjoy starting a task better than finishing it. Entertainers play as they work. Every person engages the world through four Cognitive Functions. 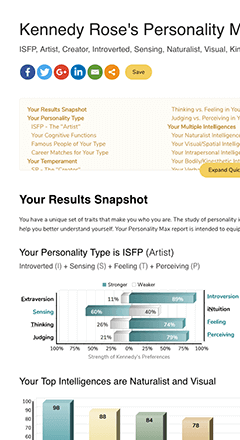 The ESFP's primary function is Extraverted Sensing and secondary is Introverted Feeling. ESFPs use this function most often. Through Sensing (S), ESFPs process data with their five senses. The Extraverted Sensing function allows them to process life through their experiences. It is being aware of what is seen, smelled, touched, heard and tasted. It is being energized by experience and living "in the moment." ESFPs use of this function is somewhat high. When Feeling (F), Entertainers make decisions based on feelings, so the Introverted Feeling function allows them to know what they value. It is the ability to see through others and know what they are like as if the ESFP had internal radar. There is a desire to connect when they identify a person with similar values. ESFPs use this function but to a lesser degree. While Thinking (T), ESFPs make decisions based on logic. The Extraverted Thinking function enables them to organize and categorize items such as thoughts and arguments. It is the ability to see the logical consequences of actions. It follows sequence and organization. ESFPs use this function least of the four. With Intuition (N), ESFPs process data through impressions, possibilities and meanings. Introverted Intuition enables Entertainers to have a sense about the future. It is the ability to grasp a pattern or plan. Information that is hard to understand and dissect is more easily processed through Introverted Intuition. ESFPs are hard workers who like to get things done. They work well in social and friendly environments. They dislike confining rules and prefer to work with freedom and flexibility. They strive to do their best and expect the same from others. They are fun to work with and are able to get along with others. People with the ESFP personality type may find satisfaction with the following careers which tend to match well with their Entertainer personality. Here is a sampling of Famous People and Fictional Characters that may share the ESFP personality type. ESFPs are lively. They possess a great zest for life. They are adventurous, enjoy new experiences and like to build new memories. They are fun and exciting companions. The ESFP's greatest contribution is their ability to create positive experiences for others.